So far this week I’ve only showcased stand-alone music tracks. As a filmmaker, the area which interests me the most is mixing music to picture. Below are a couple of recent examples of this. I’m not seasoned by any means, but these exercises made me appreciate the pressure film composers find themselves under. Music is generally added as one the last element in a production, usually just at the point when energy, money and time have all disappeared. Worse still, everyone seems to love the music when they hear it, but before long they want to start changing things – often people with little-to-no musical knowledge. It’s little wonder so many composers suffer exhaustion and mental disorders! My first “speed scoring” effort was for a composing competition. I basically only had a day to create the tune. I’m pretty happy with the result considering the time constraints. This said I was a little miffed when they decided to change the goal-posts and extend the deadline by several days (this was just after I submitted the track). There is no denying this track would have greatly benefited from the additional time to improve the clarity of the mix. This said, it was still a useful exercise even if I wouldn’t rush out and do it again. My second ‘speed-scoring’ experience came about when I was asked to make a video for an art exhibition. Once again, everything was left until two days before the opening (I only had an hour to prep, film and interview everything, after which the window of opportunity was gone). As if the lack of preparation for filming wasn’t stressful enough, the next problem was finding some music to edit against. I decided rather than spent the time trying to find the right tune – why not just write one? Which is exactly what happened. I hope some of you will tune back in tomorrow for an exciting announcement! After a rather difficult 2015, I find myself entering 2016 with renewed vigor! It feels like I’ve achieved more in a month than during the whole of 2015. If I’ve adopted a mantra this year it would be: “make it happen but keep it simple”. Simplicity often appears graceful and effortless, but the reality is getting there is usually anything but. 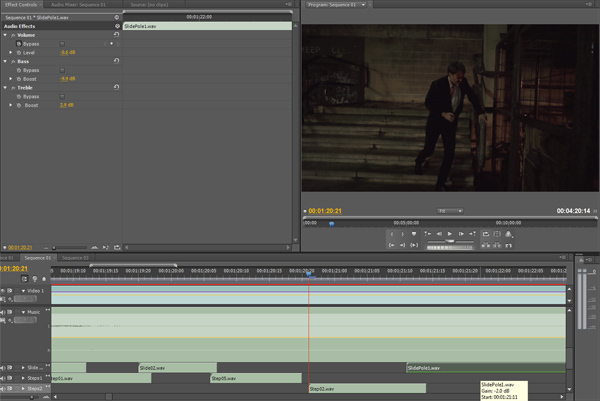 After months (indeed a year) tinkering on the edit for our project Emmi, I was going around in circles. During a test screening to the crew – it was clear that the film wasn’t hitting the spot. We discussed it with as many people as we could which resulted in a mass of differing opinions. Time passed – work, Christmas and a distinctly average Bond film all got in the way. During this downtime, I had a rare moment of clarity. The problem with the film was that it was trying to say and do too much. So away I went and pared everything down to its bare essence, the entire structure was overhauled and streamlined. Recently we re-screened the film and it is now getting the response I was looking for. This hasn’t been an quick or easy process, but I can say it has been an incredible learning experience. We now have a picture lock and it feels liberating to be moving forward again. Expect to see some new project developments soon, watch this space! Recently I met The Choice production team to discuss our assembly edit. Most film-makers will tell you this is usually a bit depressing. Once the niceties were dispensed with, I started to get information back from the crew about what worked and what didn’t. I set about correcting things enthusiastically. Feeling good, I went to the Guerilla Filmmaker’s Masterclass and got chatting to some of the editors. More feedback:”The opening doesn’t work”, “The ending doesn’t work”, “Needs even faster pacing”. Most of it was candid and invaluable advice, with only a few subjective comments. I went back to the edit suite for a seismic shake-up. I started to play around with the structure. Out went most of my favourite shots including the beloved single take (pacing). The context of the story was changing. I even removed an entire scene. All in all – a pretty brutal experience! Strangely it now feels streamlined and I’m happier. I’ve also just reached my goal: getting the runtime under ten minutes. Who knows – it might not be too much longer before I can focus on the next set of post-production headaches: sound fixing and colour grading. Despite my best intentions (and claims) that I will never edit another film I’ve directed I’m back at it again. Unfortunately the original editor (being in a similar situation to me) didn’t have time to devote to the project. It’s now been about half a year since we filmed The Choice. To be fair, I should have chased harder. On the other-hand, it’s been several months and I’ve now dropped a lot of the baggage swimming around in my head during the production phase. In fact, I’ve rekindled my love of editing (at last I can see the forest for the trees). The semi-frustrating part is that I’ve had to start right from the beginning again (would have been easier if Adobe Premiere was more accommodating with different versions – it seemingly supports Final Cut better than its own software). 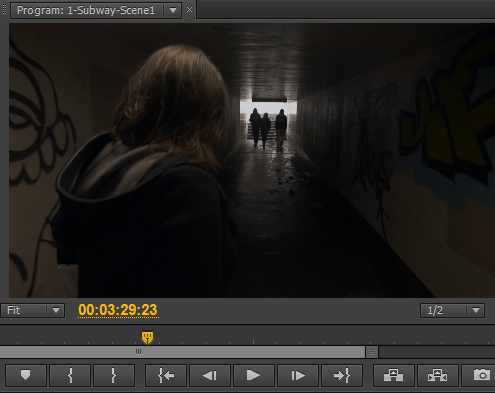 I began with what I believed would be the hardest scene to edit (it came together reasonably painlessly). As is so often the case with editing a couple of the seemingly innocuous scenes caused more grief. I’m now on the cusp of having an assembly edit (around 16 minutes). I won’t delve into editing specifics for now but I will revise my original claim. I’m not going to edit another film I’ve directed unless I’ve given it a reasonable “cooling-off” period so I can look with fresh eyes. Recently I watched the new showreel for our lovely camera person Danny MacGregor-Gill who helped us film Emmi. Great to see a couple of clips from the film made their way in amongst the other lovely imagery. Feeling inspired (and perhaps fueled with impatience whilst waiting for the first post-production assembly), I decided to cut a teaser for one of my films (a first for me). I’ve never felt any urge to cut any form of trailer for one of my films. Why now? All my films have been shorts and I feel in most cases that this medium doesn’t really lend itself well in terms of creating trailers. The films are already short, low-budget, mostly based around some kind of twist (which a trailer is likely to give away). But for this one, there is perhaps more going on than some of my other efforts and I guess I’ve felt inspired. 1. Teasers which are a complete non-entity. Case in point: Jurassic World. Many liked the actual teaser (myself included), but creating a teaser for – er- a teaser…!? Too much! Whilst on the subject – the original teaser for Jurassic Park 3 was pretty weak also (lots of sound atmosphere, full of stock footage unrelated to the film, no dinos – plays more like a bad Kickstarter campaign). 2. Trailers where most of the plot is given away. To many to mention but most recent example appears to be Disney’s new Cinderella trailer. Thankfully I don’t need to see this now! Honorary mention to Goldeneye, which had an excellent teaser (an adrenaline jolt which announces “Bond is Back”), and a rubbish main trailer – which gives away most of the plot and perhaps more criminally – the main twist. Anyway, I had a tremendous amount of fun playing with this, the final film is being assembled elsewhere so might end up rather different. This set a tone, but very little is actually revealed (no sign of babies, cats or even key characters so apologies to Rachel and Barbara who would both clearly feature in a more exhaustive trailer). The trailer isn’t finished, hopefully I can finish it by next week (hint). Most of the films shown at Film Oxford’s monthly 10×10 meetings showcase documentaries/causes/charity work. This month had a fictional film in the mix called “After the Bombs”. 1. In film terms I prefer fictitious work over factual pieces. This is the polar opposite of how I generally feel about books. 2. In the 10×10 sessions people tend to be much more critical of fictional work. The audience are more forgiving towards documentary work (even if details are incorrect, an argument is one-sided or the quality of coverage/footage is poor). 2. The whole thing needs to be edited down to 140 seconds to comply with the Virgin Media rules. 3. The sound needs finishing. If you recall, I threw all of the sound out and started from scratch. At the moment people are still gliding across the pavements. After addressing the run-time (point 2), I turned my efforts towards the final point: sound. Initially I made a list of the sounds which were obviously missing (most of which were footsteps). The next part wasn’t originally planned, I composed a score for the film. This wasn’t strictly necessary but it was part designed to cover some of the missing sound. This is easily some of my most understated work – you barely notice it’s there. I wanted to create an ambient and slightly alien soundscape, so it is mostly synthetic/electronic (with the exception of some bowed cymbals). You could argue with the exception of two tonal moments that it is less scoring and more sound design. The interesting discovery I made whilst doing this was how much quicker I am able to work when I am also the director. This also follows exactly the same pattern as my previous directorial projects – presumably because by this point I understand the requirements inside-out. With an underscore in place, I set about doing some additional foley work. I clearly could use better sound recording equipment, but one thing I did take away from this experience was how enjoyable this was! I paced up and down the street recording myself walking in various types of shoes and in different manners. The neighbours probably thought I was raving mad. I swung around the washing-line in the back garden as if I was holding on to a hand-rail. I cursed the fact I did this on a beautiful Spring morning when the birds kept interrupting with their twittering. I had some therapy by thumping against the sofa to get some solid-bass thud sounds. All of this was terrific fun! Now comes what I suspect is the less fun part – which is layering it all together.